In the past decades, many researches have been done on the design optimization of low- and high-frequency vibro-acoustic systems. However, the work of mid-frequency vibro-acoustic systems was rarely reported. As an improved statistical energy analysis (SEA), statistical modal energy distribution analysis (SmEdA) is based on the power balance between modes in different subsystems and extends SEA to mid-frequency range. 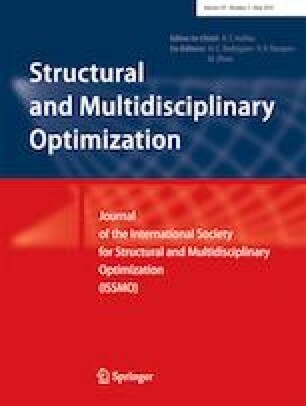 In this article, an optimization procedure for mid-frequency vibro-acoustic systems based on SmEdA is presented. First, a vibro-acoustic system can be decoupled by using the dual-modal formulation (DMF) into a structural subsystem and an acoustic subsystem. Then, the optimization model is built by designating the total energy of the acoustic subsystem as objective function and the structural thicknesses as design variables. Finally, the optimal solution is obtained by using the method of moving asymptotes (MMA) which need to be provided with the gradient information of the objective and constraint functions in each iteration. Therefore, a sensitivity analysis about the total energy of the acoustic subsystem with respect to the thicknesses of the structures surrounding the interior acoustic cavity is performed by adopting a semi-analytical method. Moreover, a coefficient condensation technique is introduced in the sensitivity analysis to avoid the dimensional inconformity of the coefficient matrices in SmEdA due to the variation of the number of modes with the perturbation of structural sizes. Numerical examples are given to validate the effectiveness of the optimization procedure. The authors would like to acknowledge these funds support. The MMA program codes used in this article were provided by Krister Svanberg of KTH in Stockholm. We are grateful to Pro. Svanberg for allowing us to use the program. The project of research presented in this paper is supported by the National Natural Science Foundation of China (U1508209, 11072049, 11472073), the Key Project of Chinese National Programs for Fundamental Research and Development (2015CB057306), the Fundamental Research Funds for the Central Universities (DUT16TD09) and Liaoning BaiQianWan Talents Program.